Stack the rings by color; match the rings by number. The count and Sort helps build the foundation for counting and color sequencing. 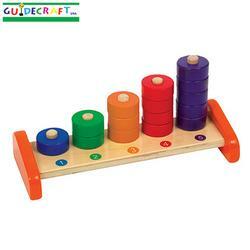 Sturdy wooden construction with rounded corners and smooth edges, safe non-toxic paints with a clear finish. Raised base accommodates floor or tabletop play.